Every great space in a home starts with great vision, design, and direction. We can help you make the most of any space, large or small. 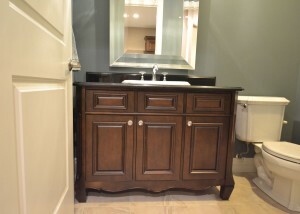 Your first step closer to a beautiful bathroom is to schedule a time to discuss possibilities. Contact us today and we will help you create that dream bathroom from design to install. A bathroom must be more than just beautiful. It must fit your needs. Different bathrooms are typically designed with various elements in mind. 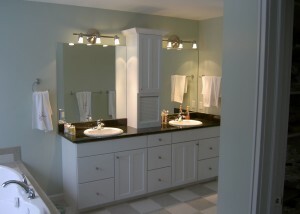 Shared bathrooms in common areas are typically simple half bathrooms that are stylish and peaceful for visitors. 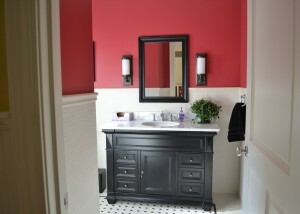 Guest bathrooms will often be full bathrooms that are slightly more elaborate or customized. Master bathrooms are the most personalized and stylized to give the homeowners a peaceful, private place all to themselves. We know how to make beauty meet function. Have you ever had a picture in your mind of what you want, yet not see it turn out the way you hoped? At LJ’s you have your very own personal bathroom designer. A designer that will listen and give you that space you picture in your mind. Our bathroom designs can incorporate garden tubs or whirlpool tubs, vanities and make-up areas, as well as, his and her spaces. Contact us today to make this dream a reality. Every edge, every seam, every color, determines the quality of the space. We give those details the attention they deserve.